What is a Bed Loft and why do I want one? What is a Bed Loft? 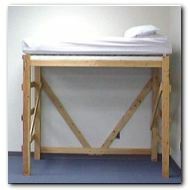 A Bed Loft is a wooden structure used by students to elevate their beds up to six feet off the ground. What are the advantages of having a Bed Loft? Space - A Bed Loft dramatically increases the useable floor space in a Dorm or Bed Room. In a Dorm Room Bed Lofts create an extra 33% of useable floor space! Comfort - By adding a Bed Loft to a Dorm or Bed Room you now have room for all the comforts of home. Like a sofa or an easy chair or a protected area for your TV, Stereo, Microwave or Refrigerator or a personal study area with a desk and bookshelves. Privacy - A Bed Loft creates separate living spaces. By adding a Bed Loft to a Dorm Room you have transformed a Sleeping Room into a Living Room. Because Bed Lofts create separate Living and Sleeping spaces a roommate's late night studying or early morning activities won't interrupt your sleep.